Commercial fishing on the Great Lakes began in the 1820s and continues today. Overfishing was a major concern a hundred years ago and, together with industrial pollution, habitat destruction and the arrival of invasive species, it almost wiped out several important species, such as lake trout and yellow perch. As a result, today’s Great Lakes food web is very different from previous versions, and much research goes into determining which fish and how many of them can be harvested from the lakes. State and federal regulations ensure that fish are harvested sustainably from the Great Lakes. Two organizations, the Great Lakes Fishery Commission and the Great Lakes Indian Fish and Wildlife Commission, help seven states, 11 tribes and two countries work together to manage the Great Lakes fish populations. 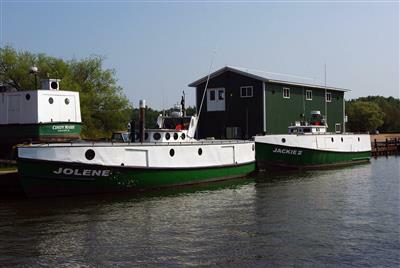 Commercial fishing licenses are limited (10 licenses in the Wisconsin waters of Lake Superior and 65 licenses in the Wisconsin waters of Lake Michigan). Also, for some species, such as Lake Superior lake trout and Lake Michigan lake whitefish, the allowable number of fish harvested is determined by regular scientific sampling. The annual harvest is then divided up among commercial fishing licenses into quotas. Thus each commercial fisher has a guaranteed percentage of the total allowable annual harvest and doesn’t have to compete with others. Additional regulations regarding types of gear used and fishing locations ensure minimal catch of non-targeted fish species and protect sensitive habitat. Gill nets and trap nets are the primary ways fish are commercially harvested in the Great Lakes. The gill net was one of the first pieces of modern fishing equipment introduced to the Great Lakes in the 1800s because it could be used from small fishing boats with little investment in equipment. Deep water trap nets were introduced in the 1920s and can be more efficient at targeting specific species of fish and make it easier to return non-targeted fish to the water. Both types of nets are set in place by fishermen and retrieved on another day. The U.S. portion of the Great Lakes Basin fishery is valued at $22.5 million, with 40 percent coming from Lake Michigan harvests and 18 percent from Lake Superior harvests. In 2011 Wisconsin commercial fishing boats harvested 3.9million pounds of fish from the Great Lakes valued at $5 million. Lake whitefish made up 58 percent of the harvest. Read this Sea Grant fact sheet for more information about the Wisconsin whitefish commercial fishery. 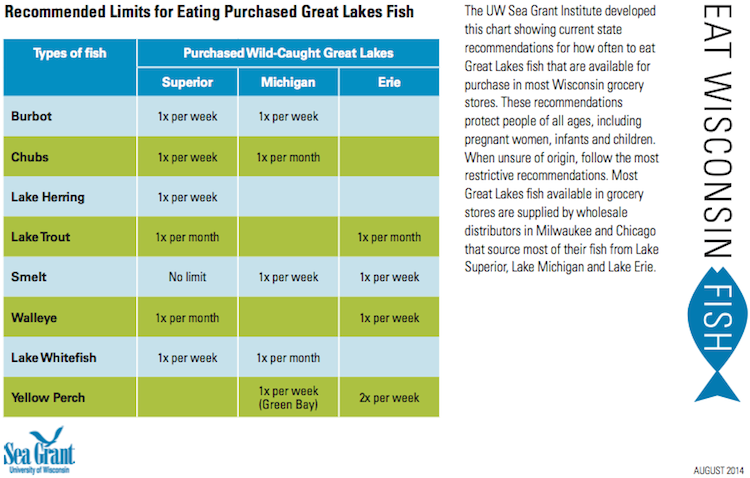 You can safely eat wild Great Lakes fish by following state recommendations. State scientists regularly test fish and issue advisories so consumers can make informed decisions about their diets. Wisconsin has issued fish consumption advisories since the 1970s and updates them yearly. If you like to catch and eat your own fish, please visit the Wisconsin DNR website for the most recent advisories as these vary by body of water and fish size. The site also has detailed information about contaminants. Michigan State University: Great Lakes Whitefish: Is fresh whitefish better than frozen whitefish?